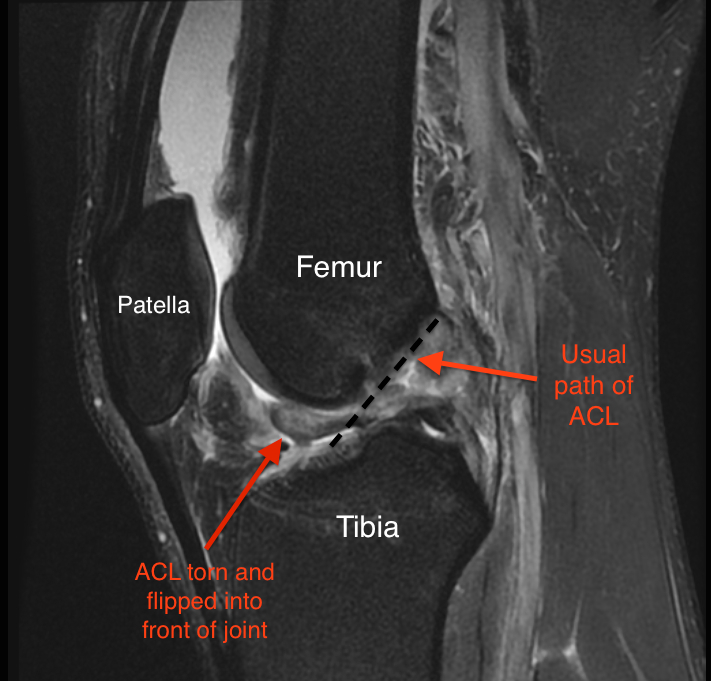 Torn ACL - Symptoms and Diagnosis (Video) - Jeffrey H. Berg, M.D. Pop! Ouch! No its not an old Batman episode. If you were playing a team or racquet sport… Or were skiing and fell…Chasing your kids while playing tag…Or simply dancing. If you felt a painful “pop” and you had to stop the activity…Your knee then began to swell and become stiff…Unfortunately, you likely have a torn ACL (Anterior Cruciate Ligament. The ACL is one of the four major ligaments of the knee. It’s in the center of the knee and connects the end of the thighbone to the top of the shin bone. It provides stability to the knee and its presence is critical for pivoting, cutting or landing from a jump. After a torn ACL, participating in racquet sports, team sports, hiking, dancing and any other sports or activities that require those skills is difficult as well as dangerous to the knee. All of these symptom are not always present when the ACL tears. However, an acute injury must occur. Without one, the ACL cannot be torn. Usually there is a non-contact twisting injury. In the video below, Derrick Rose tears his left ACL as he plants his left leg and cuts to his right. Less commonly, ACL tears can occur from an injury involving direct contact to the knee such as during a football or soccer tackle or while getting hit by a car. These injuries are often more severe and frequently occur in conjunction with tears of other knee ligaments. If you have had these symptoms, it is a good idea to see an Orthopaedic Sports Medicine doctor. . Your sports medicine doctor should begin by asking you questions about the injury, trying to elicit a history of the events or symptoms discussed above. To a well-trained sports medicine doctor, these findings would be very suggestive of a torn ACL. An exam can confirm the diagnosis. The doctor will often want to manually assess stability, not only to diagnose the torn ACL, but also to assess for other ligament injuries. X-rays are often obtained to look for significant breaks in the bones. Fortunately, these rarely occur with most ACL injuries but even without a torn ACL, breaks can give many of the same symptoms and therefore must be ruled out. For a well-trained sports medicine doctor, a comprehensive history and exam and negative X-rays are often enough to make the diagnosis of a torn ACL and no other testing is needed. However, in this day and age, an MRI is usually obtained, not only to confirm the diagnosis but also to evaluate for injuries to the menisci, the cartilage on the ends of the bones around the knee and the remaining ligaments.